Our “Learning Strategies - A Foundation For Lifelong Learning”© workbook is a comprehensive educational tool to assist students master skills necessary to help them balance school work and other activities in their busy lives. Presented in a three-ring binder format, it is set out in seven modules that address every aspect of learning including self- assessment, time-management, methods of note taking, communication, test-taking, reading and writing skills. Each chapter has three or more lesson plans and handouts. The lessons outlined in this guide can be used with large or small groups and in a one-on-one situation. The Discovery Wheel is a self-assessment tool. The following areas are covered in this exercise. Why forever and always tests? 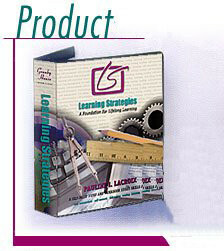 We have every confidence that students will benefit from using our Learning Strategies© program. If you are not satisfied, we offer a 30 day money back guarantee.